Call dinner 9-1-1, and Mushroom and Sundried Tomato Quesadillas will pick up the phone every single time. On nights when I’m desperate for a quick dinner fix, I begin to seriously consider opening the dusty can of clam chowder that’s been lurking at the back of our pantry since Ben’s bachelor days. Just as I am about to pinch my nose and reach for the can opener, my emergency meal hero bursts onto the scene in a blaze of edible glory: the endless adaptable, speedy-to-prepare, and deliciously reliable quesadilla. 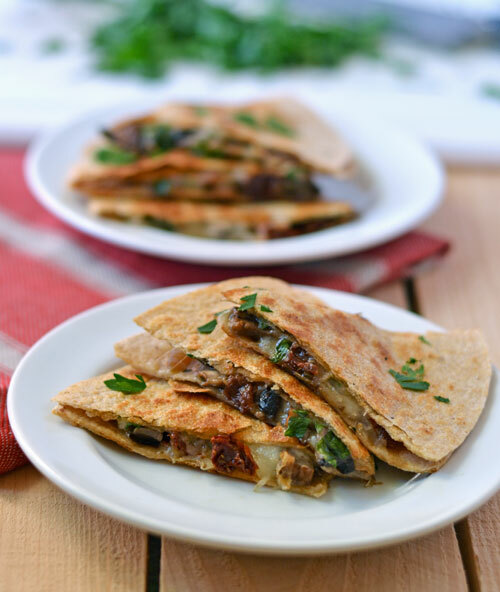 Mushroom and Sundried Tomato Quesadillas are a bright Italian medley of meaty Portobello mushrooms, fragrant sundried tomatoes, gooey Mozzarella, and sharp Parmesan. The ingredients are straightforward, the preparation simple, and the results buenisimo. 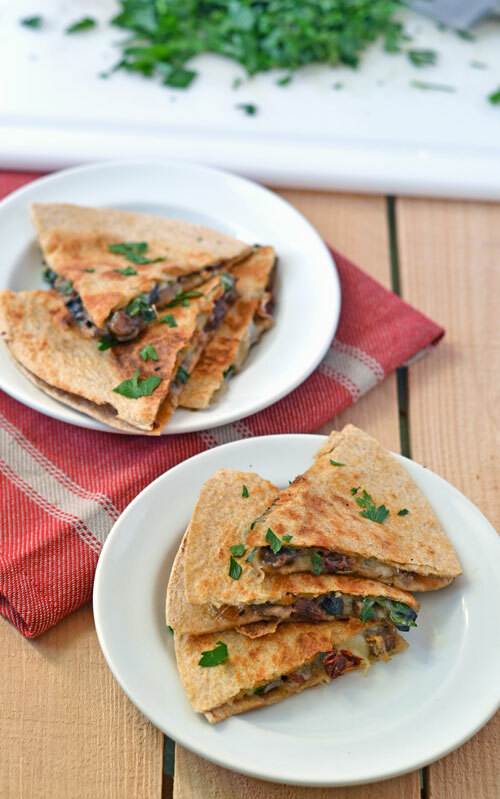 Mushroom and Sundried Tomato Quesadillas are a part of my Quick and Easy recipe series with California Olive Ranch. Like my first two recipes (Eggplant Ricotta Grilled Cheese and Black Bean Beef Burgers with Blue Cheese and Onion Marmalade), Mushroom and Sundried Tomato Quesadillas offer gourmet flavor in a hurry. With Mushroom and Sundried Tomato Quesadillas, 15 minutes are all that stand between your empty plate and dinnertime delight. Leave that creepy can of clam chowder on the shelf—Mushroom and Sundried Tomato Quesadillas are here to save the day. My hero! Meaty Portobello mushrooms, flavor-packed sundried tomatoes, and gooey Mozzarella cheese join forces to create an Italian-inspired quesadilla that's quick to prepare and boasts a gourmet flair. Heat 1 tablespoon extra virgin olive oil in a large skillet over medium high heat. Add onion and cook until beginning to soften, about 2 minutes. Add the mushroom slices, garlic, and salt, and cook until the mushrooms are lightly browned and the liquid has evaporated. Remove mixture from pan and set aside. Toss the Mozzarella and Parmesan cheeses together a small bowl. Wipe pan carefully with a paper towel (it will be hot), then return to heat and brush lightly with extra virgin olive oil to prevent sticking. Place the first tortilla on the skillet, top with 1/3 cup cheese mixture, 1/4 of the mushroom mixture, 1/4 of the sundried tomatoes, 2 tablespoons fresh parsley, then an additional 1/3 cup cheese. Lay a second tortilla on top. Press down with a spatula to remove any air pockets. Cover pan (if you do not have a fitted lid, a large sheet pat set over the skillet works well) and cook 1 to 2 minutes, checking often, until the bottom tortilla is crisp and brown. Flip quesadilla, cover and cook for 1 to 2 additional minutes until the second tortilla is crisp and brown. Remove to a serving plate. Repeat with remaining ingredients so that you have 4 quesadillas total. Slice into wedges and serve immediately. Love your twist on quesadillas, these Italian flavors are the best! These quesadillas sound so good! Love this combo… these sound amazin! “Dinner 911” love it! I really want to call now. I really like both sun dried tomatoes and mushrooms, but haven’t tried them together (that is going to change) We eat quesadillas all the time … must try this. Thanks! quesaillas always come to my rescue too – will def be thinking of your version next time. Haha, you sound like me! I have boxed macaroni and cheese on hand for those dinner emergencies :P However, I am ashamed to admit that it was bought much more recently than your clam chowder can. These quesadillas look super – pinned! Would you believe that I’ve never made a quesadilla?? I’m so missing out! I need to try one (or three, they all look amazing) of your recipes soon. They sound like a perfect dinner and they look scrumptious, yum! Dang girl… now I’m real HUNGRY! Love me a good ques! Quesadillas always answer my 911 dinner call. Always. I could dive right into a big plate of these! Oh my goodness how perfect! Quesedillas are a love of mine and always will be – I love combination of mushroom and sundried tomatoes, I bet that is just amazing!! Love the flavor combo! These sound amazing! What great flavors for a quesadilla! We often end up making quesadillas on busy nights! Ha ha!! Stay away from the canned soup! This quesadilla looks way, way better! Italian quesadillas? Heck yes. Also, when have those cans officially been in the cupboard too long? Cause I think I may have a few that have crossed over. Courtney, I don’t even want to know! All the more reason to stay away I think. I could toss it out, but for some reason, I can’t make myself do it! Wow how could I forget about quesadillas? It’s never occurred to me to make them for dinner. You are right, they are so versatile and tasty and easy. And yours looks yummy. Thanks for the reminder! Quesadillas really are so versatile! This flavour combination is absolutely mouthwatering… thanks for sharing! I made these yesterday and they were delicious. Thank you for the good recipe! Yippee!!! I’m so so happy that you enjoyed these. It never fails to make my day to hear from readers who try my recipes. Thanks for taking time to share your review and have a wonderful weekend!